We promised pictures! 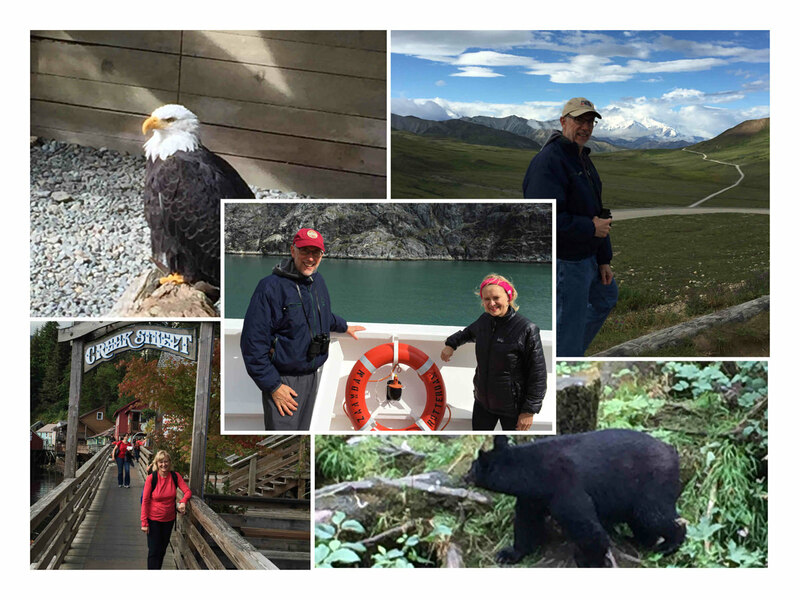 As mentioned in last month’s newsletter, Jim and I took our first trip to Alaska in early August and we would like to share our experience with you. After flying into Anchorage, we took the Alaskan Railroad to Denali National Park, a six million acre park with only a single road going through it. Surrounding this road is a spectacular blend of views and nature at its best. What a treat it was to see grizzly bears, moose, Dahl’s Sheep, Black bears, bald and golden eagles in their natural habitat. Among the amazing wildlife in Alaska, there are also some truly amazing people. During our excursion at Denali, we had the pleasure of getting to know our bus driver Lisa Frederic and her extraordinary story she put on paper in the book “Running with Champions.” Her book describes the incredible journey life unexpectedly led her on that one day brought her to race in Alaska’s Iditarod. If you can find a copy, you will learn many of the things we learned about Lisa and the park during our bus ride at Denali. The bus trek through Denali was just the beginning of our Alaskan adventure. We continued to Seward where we boarded a ship that took us through Haines, Skagway, Juneau and Ketchikan. We rafted through a 50,000 acre preserve for eagles along a braided river. It is braided because 10,000 tons of glacial silt change the channels in the river by the hour. We also rode the White Pass Railway out of Skagway up to the top of the pass and the border with Canada. We learned the history of this route and how it was used by miners at the end of the 19th century to haul supplies up the pass to the gold fields of the Yukon. Finally, we visited another preserve with an extended boardwalk that allowed us to see black bears catching salmon in the wild. One of those most magical memories we were fortunate enough to take back in our memories was watching the whale bubble feedings. It was incredible to see the whales coordinate blowing bubbles as a group to bring the plankton and other food to the surface. The birds were well coordinated with this plan as well and made sure not to miss out on the action from above. It was a feeding frenzy and we watched the whole thing happen before our eyes. The trip was even better than we imagined and we are so happy we got the experience of a lifetime. We hope you enjoy the pictures and a few of our little stories from our Alaskan adventure.